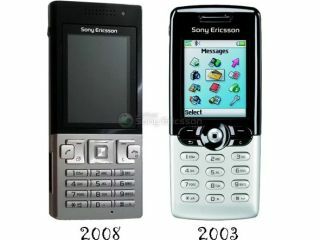 Sony Ericsson to update old classic? We were all there, back in the nascent days of the mobile phone. The days when evolution was linear: a phone, then phone with a colour screen, then a camera etc., etc. But in today's finger-swipin', GPS totin' portable mobile terminal days, some out there might hanker after the old classics once in a while. The chaps over at the Unofficial Sony Ericsson blog have showed comparisons with the new device, codenamed Remi, and the old workhorse from 2003. The Remi, which is due to be coming soon (though no word on exact dates), features a 3.2MP camera, HSDPA 3.5G connection and uses the A2 software platform. The phone is also packed into a skin alarmingly similar to the current W890 walkman phone, though isn't branded as such. It's hard to see the market this phone is being aimed at, especially given the recent profits warning SE has just delivered. We might have expected either a lower-end device, for the emerging markets, or a more diverse handset that would capture the imagination of the phone market, a la the new C-Series. Still, if you loved the T610 and have been weeping ever since you dropped it in a pile of ketchup, this could be the one for you.